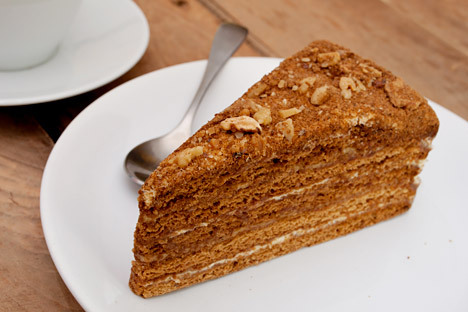 The most favourite Russian honey dessert is the seemingly complicated and time-consuming “Medovik” tort. Source: Lori / Legion Media. I conducted an informal straw poll amongst my Russian friends to determine the most popular honey cake. Everyone’s favorite honey dessert was the seemingly complicated and time-consuming “Medovik” tort. Honey has played an important part in Russia’s culinary line up since pagan days. Long before sugar was easily available, honey was Russia’s primary sweetener, used in many different aspects of cooking: to ferment drinks such as mead and kvass and in baking cakes and cookies such as gingerbread. Honey was also a reliable medicament, both topical, as a salve, internal to relieve fevers and chills. In Russia today, honey, jam, and hot tea are still considered the first line of defense for a range of ailments. Recipes for honey cakes abound in Russia. Along with gingerbread, Western Russian traditional honey cakes are often prepared with walnuts and apples, bringing together the flavors of the three August harvest festivals, known in the Christian liturgical calendar as the three “Saviors.” August 14 is “Medoviy Spas,” or “Honey Savior” considered the first day when honey can be gathered from the hives and combs. August 19 marks “Yablochniy Spas” that is followed on August 29 by “Not Made by the Hands Savior,” during which nuts take center stage. I conducted an informal straw poll amongst my Russian friends to determine the most popular honey cake and the results made me a bit nervous. Everyone’s favorite honey dessert was the seemingly complicated and time-consuming “Medovik” tort. I shouldn’t have been surprised: almost every office party I’ve ever been to in Russia included a Medovik front and center: a multi-layered cake of flat biscuit and a creamy, caramel filling topped with walnuts. Like most store-bought cakes in Russia, they always looked flawless and mouth-watering, but invariably tasted like sawdust. I knew from classic French cookbooks that the biscuit/filling combination could be a winning one, so my challenge was to tweak the flavors and textures. Traditional Russian cookbooks make little or no mention of Medovik, from which I deduced that Medovik gained its intense popularity during the Soviet era. This hunch was confirmed when I began to compare recipes from Soviet-era culinary tomes – not very reliable or easy to use. Opinions differed wildly on ingredients, but all had in common a very Soviet era ingredient: a tin of sweetened condensed milk, boiled, in the tin, for two and a half hours! Skeptical, I boiled one up, and then I understood where the caramel flavor came from: the heat gently caramelizes the sugar in the condensed milk and produces a pudding-like substance, which, unfortunately is also very slippery and hard to handle. The flavor was also very tinny. After a few frustrated attempts to keep the biscuit layers from slipping and sliding, I headed to the pantry for additional ingredients and equipment. Adding sour cream and cream cheese to the condensed milk and butter solved the slipping and sliding and greatly enhanced the flavor of the finished product. A spring form pan and wooden skewer helped to keep it all together in the refrigerator overnight as biscuit slowly absorbed the creamy filling. The result was far cry from sawdust! Making Medovik is a multi-stage process, involving cooking the separate cake layers one by one in the oven. It also requires chilling the tort overnight in the refrigerator. Plan accordingly. 2. Prepare four or five pieces of parchment paper 10”x10” inches (25cmx25cm). 3. Place the tin of sweetened condensed milk into a large saucepan and fill with cold water. Cover and place on medium heat. Bring to a boil and simmer for two and a half hours. Check the water level periodically and add more to ensure the tin is covered with water. When finished, remove the tin with a pair of tongs and set on a cooling rack to come to room temperature (at least two hours). Do not try to open the tin while the mixture is still hot! 4. Sift the flour, spices, and salt together and set aside. 5. Place a large glass bowl or the bowl attachment of a standing mixture over a saucepan of simmering water. Place the eggs, butter, sugar, and honey into the bowl and whisk gently until the mixture is completely combined and velvety. Do not let it over boil. 6. Remove the bowl from the saucepan and add the soda. Whisk vigorously for thirty seconds. 7. Beating constantly with an electric mixer or whisk, add the flour mixture in ½ cup batches until the dough is elastic – the ideal will be something between the four and five cups of flour. You should be able to easily roll a ball of dough between your hands without it sticking to them. 8. Divide the dough into 8 or 9 balls and place them on a baking sheet lined with parchment paper. 9. Sprinkle a tablespoon of flour onto a one of the prepared sheets of parchment paper laid flat on your working surface. Use a rolling pin dipped in flour to roll a ball of dough out to 1/8” thickness. 10. Use the bottom of the 8-inch spring form pan to trace a circle of dough. Remove the trimmings and set them aside. Place the parchment paper with the dough onto a baking sheet and place in the middle rack of the preheated oven. Cook for three to four minutes until the cake is golden brown. Remove parchment paper with cake onto a cooling rack. Repeat with all of the dough balls and let cool for one hour. Reuse the parchment paper as soon as the cake has cooled for fifteen minutes. 11. Roll the trimmings out and bake them as one sheet of dough – don’t worry about the shape since you will crush them for the topping. Set aside. 12. Place butter and cream cheese in the bowl of a standing mixer and beat until they are creamy and combined. 13. Add the sugar and beat until absorbed. 14. Add the condensed milk and sour cream and beat for thirty seconds. The mixture should be shiny and smooth. 15. Chill the filling for thirty to forty minutes. Reserve 1-½ cups of filling to ice the edges of the Medovik. 16. Line the bottom of the spring form bottom with parchment paper cut to fit. 17. Place a cake layer on the spring form bottom and top it with ¼ cup of filling. Spread the filling evenly across the layer with a cake knife. Place the next cake layer on top of the filling and repeat with all of the cake layers, ending with a layer of filling on top. 18. Carefully insert the wooden skewer into the center of the cake through all the layers. This will hold the Medovik together as the biscuit absorbs the filling. 19. Wrap the assembled tort in a layer of parchment paper and gently fit the rim of the spring-form pan around it. Do not force the rim to close completely, but gently ease the rim snugly around the cake. 20. Place in the refrigerator for at least five hours, but ideally more like twelve. 21. Crush the layer of biscuit cake made from the trimmings by pulsing it in the food processor together with the walnuts. Toss the mixture gently to combine. 22. Remove the Medovik from the refrigerator and frost the sides with the remaining filling. Sprinkle the top and sides with the topping and serve. Readers, are you curious about a Russian dish? Want to know its history or how to make it? Leave a comment to this article and we’ll try to answer it!